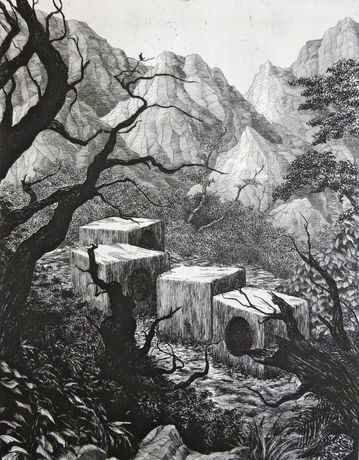 Primarily focused on landscape, de Sade’s work is concerned with memory, nostalgia, myth and narrative. Following 18 months of residencies in Japan, Thailand and USA, Dolores de Sade is returning to London with this solo exhibition. Drawings and ikebana created on these travels will be presented for the first time in the UK. Dolores de Sade studied Fine Art and Printmaking at the Sir John Cass School of Art and the Royal College of Art and holds a PhD in History from the University of York. She has exhibited widely in the UK and internationally. In 2011 she was the recipient of the Birgit Skiöld Memorial Trust Award and the Royal Academy’s British Institution Award. She was Chair of East London Printmakers and is an active member of the Royal Society of Painter-Printmakers. Her work is held in the Victoria and Albert Museum, the Royal College of Art, Ashmoleum Museum, British Museum and the Government Art Collection, as well as public and private collections in China, Japan, USA and Thailand.